BLOOMING PRAIRIE, Minn., April 10, 2019 /PRNewswire/ -- The excitement has been building since last year as the Bandit Big Rig Series heads to Myrtle Beach Speedway on April, 27th to compete at this historic speedway for the first time ever! The Bandit Beach Battle will determine which Bandit has what it takes to tame this iconic track on the second stop of the 2019 race season. "It's going to be intense," said Bandit GM Jason Johnson. "Coming off our first race in Mobile - and completely packing the place - is pretty exciting." The Bandits have arrived and with this race (originally scheduled to take place last September), Johnson and the rest of the Bandit Series teams are anticipating another packed house! "We've had our eye on this one since last year when Mother Nature sent a hurricane through the region and we had to postpone the race until 2019. So now it just builds on what we had originally planned, and can't wait to put on a great show for these awesome Bandit fans!" The Bandit race is just part of a big week of events planned at Myrtle Beach Speedway. The week kicks-off with the Horry County Fair, and is capped-off by big rig excitement for fans of all ages. Activities on Saturday will also be headlined by the Diesel Laptops Technician Skills Challenge. Technicians who have what it takes to compete and want to learn more can click here. Tickets for this event are on sale now and fans can purchase online at www.banditseries.com. This exciting and affordable family event has activities for the kids and events going on all day - including a Fan Series Truck Show and, of course, the thrill of big rig racing. Race gates open at 1:00pm and fans are invited to meet the Bandit Series drivers on the front stretch of the speedway starting at 2:00pm - the green flag drops at 4:00pm. 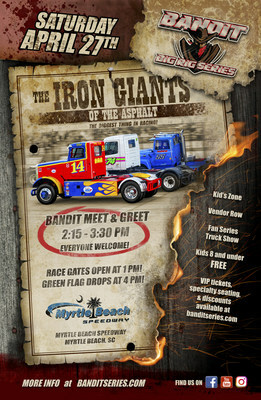 The Bandit Big Rig Series brings back big rig truck racing to the short track in the United States. The series was designed to be affordable and accessible for anyone interested in putting together a race team, and something new and exciting for the average fan.